Lively Eaters unique multi-disciplinary feeding therapy approach encompasses nutrition, sensory preferences, oral motor skill, family emotional support and mealtime strategies which are individually tailored to each family we support. Our experienced therapists are committed to helping children and families to understand what makes a successful mealtime. Whether your child has a diagnosed feeding or swallowing disorder, you notice your child is a very fussy eater or mealtimes are causing a significant level of stress for you and your family, Lively Eaters is able to help. These vibrant groups utilise individual children’s sensory and food specificities to develop, create and cook specially chosen recipes. Facilitated by the Lively Eaters Occupational Therapists and Speech Pathologists, a range of sensory, exploration and hands-on strategies are incorporated into these cooking groups. Children continue to surprise at the end of the group when they are keen to enjoy their new creations – foods which they have never engaged with previously. Please speak with your Lively Eaters therapist or contact Reception to determine whether Cooking Club and school holiday Cooking Camp would be beneficial for your child. Recommendations are provided on the day of the assessment, followed by a full written report, so that home follow up can occur. Therapists will also be able to carry out a clinical assessment of babies/children who are at risk of aspiration and refer to appropriate medical services if deemed necessary. Therapy sessions and ongoing follow up is negotiated with the family at the time of the initial assessment and re-evaluated as progress is made. Therapy sessions are carried out at the Lively Eaters clinic rooms, your child’s home, school or childcare as negotiated and as deemed appropriate. The frequency and number of sessions will depend on the severity of the eating/feeding difficulty, your child’s response to strategies and techniques and the amount of home follow up. With a dynamic and highly skilled team at Lively Eaters it may be appropriate to move between different therapists at different times depending on progress and challenges. This seamless transition is important to ensure that the needs of the child and family at any one given time, are being met. 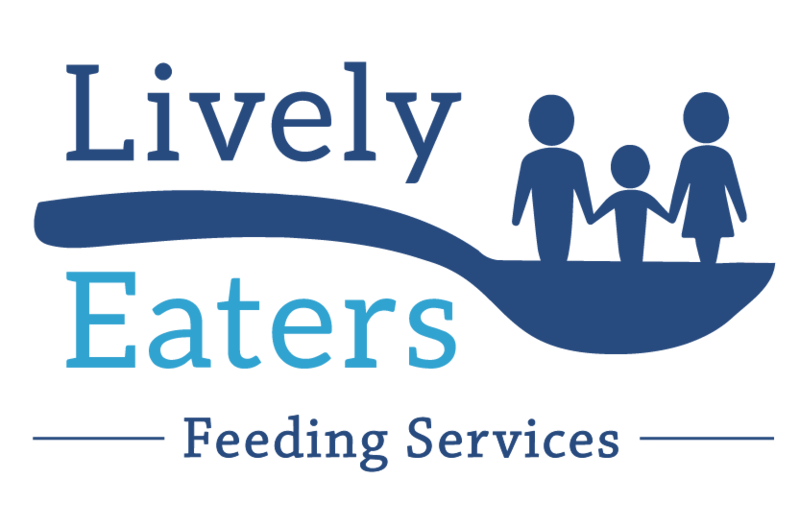 The Lively Eaters Fussy Feeders therapy program is an intensive, individualised and holistic approach to mealtime behaviours, expectations, family dynamics and factors which are impacting on a child’s ability to progress with their feeding. Each program is developed individually and specifically for your child and your family as we respect that your family unit is unique and feeding therapy can not be a ‘one size fits all’ approach. The therapists involved in the intensives are highly skilled at observing, interpreting and understanding how a child responds to food and mealtimes, how the family respond to these behaviours and how together this impacts on the mealtime dynamic. Through our intensive residential program these challenges are addressed with the family, without the everyday pressures of school, appointments, work and all other factors which make mealtimes more challenging. Our Fussy Feeders program operates either from The Memorial Hospital, at the child’s home (local families) or rented accommodation in Adelaide (interstate families). Our highly experienced Paediatrician, Dietitians, Speech Pathologists, Occupational Therapists and Parent/Child therapist support your family throughout the week long program. Children must attend for an initial assessment (either via Skype or in clinic) before consideration into this program will be made. Typically children whose feeding skills have ‘plateaued’ or for whom there are many influential environmental factors, benefit greatly from this intensive and highly supported approach. For further information about this program please contact Lively Eaters reception. Utilising the ‘Lively Approach’ this innovative program is the only private research based program of its kind in Australia. Weaning children from naso-gastric or PEG feeding is carried out within our intensive inter-disciplinary therapy program which operates at The Memorial Hospital (North Adelaide). Our experienced therapy and medical team provide an individualised, holistic approach to tube weaning children Australia wide and internationally – all within a medically monitored and extremely well supported environment. Lively Eaters Speech Pathologists, Dietitians, Occupational Therapists, Parent-Child therapist and Paediatrician are experienced at addressing the many issues and concerns which arise around the mealtime environment and a child’s behavioural response to learning to eat orally. The intensive week is one component of the weaning journey which often takes place over many months prior and post the inpatient component. We strongly encourage all family members to be active participants during the weaning process. The duration of the in-patient stay will be negotiated for each individual child dependent on their needs and all families are followed up to ensure ongoing success with oral eating and drinking. Children must be deemed suitable for this service by Emily Lively following an initial assessment and responses to therapy sessions. Families from overseas, interstate and regional South Australia are warmly welcomed to access this service. To obtain further information about the program please contact the clinic directly on (08) 7226 6395. Our Dietitians provide a range of services both in the clinic and through the intensive program. If you have concerns with your child’s diet, allergies, nutritional status or growth you may benefit from an initial consult. For enterally/tube fed children, our Dietitians are very experienced with the complications and difficulties that are often experienced by tube fed children. We work towards making tube feeding as functional ,practical and successful as it can be, including the use of blenderised diets. Our Dietitians play a very important role in the journey for children from tube to oral feeding. They are actively involved in all steps of the process from pre-wean, during the wean and post-wean to ensure nutrition goals are achievable and realistic. For many of our Fussy Feeders it is valuable to have a full diet analysis to determine if/where nutritional deficits may be. The Lively Eaters dietitian can recommend the best supplements to ‘fill the gap’ (if required) or give you piece of mind that your child is nutritionally complete. They provide invaluable advice and to our team of experienced therapists on specific nutrition goals for your child’s therapy. Should you be concerned about your child’s eating patterns and wish to book a consult, please contact the clinic directly on (08) 7226 6395. Children with additional mealtime support requirements or a compromised swallow will require an oral eating and drinking care plan (OEDCP) for them to attend childcare/ELC/school/vacation care. Assessment, development and ongoing monitoring of the care plan can be arranged with one of our Speech Pathologists. Please phone Reception to make an appointment. At Lively Eaters the emotional and behavioural elements of successful feeding are recognised and highly regarded as a key element in moving forward with successful eating. The parent-child relationship provides the base from which developmental tasks like feeding, sleeping and play emerge. This relationship provides the security and emotional support that helps children take the many small steps towards independent, self-regulated eating. Many of the families that come to Lively Eaters have experienced early or traumatic births, lengthy hospitalisations, invasive medical procedures or confronting developmental diagnoses. Many of these experiences and the very nature of the diagnosed condition can throw the parent/child relationship “off track”. Adjusting to a medical/developmental diagnosis and managing complicated treatment regimens can be overwhelming and exhausting. Sometimes parents can come to feel more like a therapist than a parent. Many children and parents, can lose trust that food can be safe and enjoyable. For some children food can come to be seen as something to avoid and resist and negative behaviours can quickly spiral. Mealtimes can come to be coloured by anxiety or conflict for both the child and parent. The Child/Parent Therapist can help families to understand and rework the dynamics of mealtimes. If this seems familiar or if you have experienced any of the difficulties listed below you may benefit from exploring this support. High levels of conflict or anxiety/withdrawl for any member of the family, loss of any enjoyment in mealtimes “dread, worry, anger” swirling around the family relationships. It may be our recommendation that to be able to ‘move forward’ with successful feeding, support through our Parent/Child Therapist is one of the avenues which needs to be explored. A portion of these sessions can be rebated by Medicare through a Mental Health Care Plan, through Private Health insurance (Extras, Occupational Therapy cover) or under NDIS plans. Please speak with your Lively Eaters therapist if you would like further information about this often misunderstood or under acknowledged area of childhood feeding challenges. Specific training workshops can be tailored to meet your needs. Please contact info@livelyeaters.com.au or call to discuss your specific requirements. Private health insurance extras cover (if your cover includes Speech Pathology, Occupational Therapy or Dietetics). A Chronic Disease Management plan (formally Enhanced Primary Care Plan) which is completed by your GP prior to your appointment. The care plan can be made out to either Dietetics, Speech Pathology or Occupational Therapy (depending on which therapist you are working with) and entitles the child to 5 rebates per calendar year to the value of $52.95/session. The family is required to cover the gap payment. Families are unable to use both Medicare and Private Health rebates in the one consult. Mental Health Care plan for access to our Infant Mental Health worker. This plan must be completed by your GP/Paediatrician/Psychiatrist prior to your first appointment and entitles the recipient to 6 rebates per year initially (with the option to extend) to the value of $74.80/session. The family is required to cover the gap payment. Depending on the criteria your child meets, there are three (3) different Initiatives that can be accessed from Medicare. The CDM is available for those clients with chronic or terminal medical conditions. Your eligibility is determined by your GP including those requiring multidisciplinary, team based care from a GP and at least two other health care providers (such as an Occupational Therapist). Those that are eligible can claim a maximum of five (5) allied health services in the period from 1st January to 31st December (MBS items 10950-10970), however your referral can remain current for two years. If any of your 5 sessions are carried over to the following calendar year as long as your date of the initial referral remains current (within 2 years) you can use the remainder of the sessions available under that referral. The MBS item code for Speech Pathology is 10970; Occupational Therapy is 10958; Dietetics 10954 with a rebate of $52.95. The 5 sessions can be a combination of therapists and once they have been completed, the therapist will write a completion summary back to the GP. If any of your sessions are carried over to the following calendar year as long as your date of the initial referral remains current (within 2 years) you can use the remainder of the sessions available under that referral. At the completion of the 10th session, the OT will write a completion summary back to the referring practitioner. The MBS code used for this Initiative is 80135 with a rebate of $74.80 available. In 2008, the Helping Children with Autism (HCWA) program created new items in the MBS to provide early intervention services from eligible allied health professionals (occupational therapists, psychologists, and speech pathologists) for children diagnosed with autism/pervasive development disorder (PDD). Medicare items are available for eligible children to access services from eligible audiologists, occupational therapists, optometrists, orthoptists, physiotherapists, psychologists and speech pathologists. A child is eligible to access the autism program if he/she has a treatment and management plan provided by a paediatrician or psychiatrist (after referral from a general practitioner) before the child’s 13th birthday with treatment services to be completed before the child’s 15th birthday. A referral from a paediatrician (using MBS item 135) or psychiatrist (using MBS item 289) is required to receive allied health treatment services (MBS items 82020 (Speech Pathology), 82025 (Occupational Therapy)). The MBS code used for this is Speech Pathology 82020 and Occupational Therapy 82025 both with a rebate of $74.80 available. Better Start Early Intervention Services for Children with a Disability funding. As per the FAHCSIA guidelines eligible children are able to use their funding to cover part/all of the assessment/therapy sessions. Please bring your child’s confirmation letter to the intial assessment so that funding may be utilised. Helping Children with Autism funding. As per the FAHCSIA guidelines eligible children are able to use their funding to cover part/all of the assessment/therapy sessions. Please bring your child’s confirmation letter to the intial assessment so that funding may be utilised. NDIS / Disability Care Australia funding. Lively Eaters is a recognised provider under the National Disability Insurance Scheme – Disability Care Australia. Please ensure your NDIS plan has a Service Agreement for Lively Eaters prior to your initial consult. The intensive hospital based programs are partly covered by Private Health Insurance Hospital cover with an additional Program Fee payable (please contact our clinic for further details regarding this). Dependent children must be covered under the family cover for this to be applicable. The parent/carer is covered to stay with the child for the duration. Families who do not have private health insurance (hospital cover) are encouraged to contact the clinic directly to enquire about a quote for the intensive programs. The cost of our program is considerably less than international programs and we are flexible in how and where this may be carried out in order to assist families financially. Lively Eaters therapists successfully work with families within the home or apartments (for interstate families) to modify, adapt and improve feeding behaviours, mealtime enjoyment and acceptance of different foods. An individual quote will be prepared for your specific circumstances following an initial assessment, should this be the most appropriate way of assisting your family. We’re happy to help answer your queries. Chat with us!